Maui Banyan Resort is situated on 8 acres of beautifully landscaped grounds located in South Maui across the street from the popular Kamaole Beach Park II. This white sandy beach is perfect for swimming and snorkeling. It is a 5-minute drive to the Wailea Resort shops, golf courses, and tennis courts. Maui Banyan features a swimming pool, hot tub, BBQ area, tennis court, and covered parking. 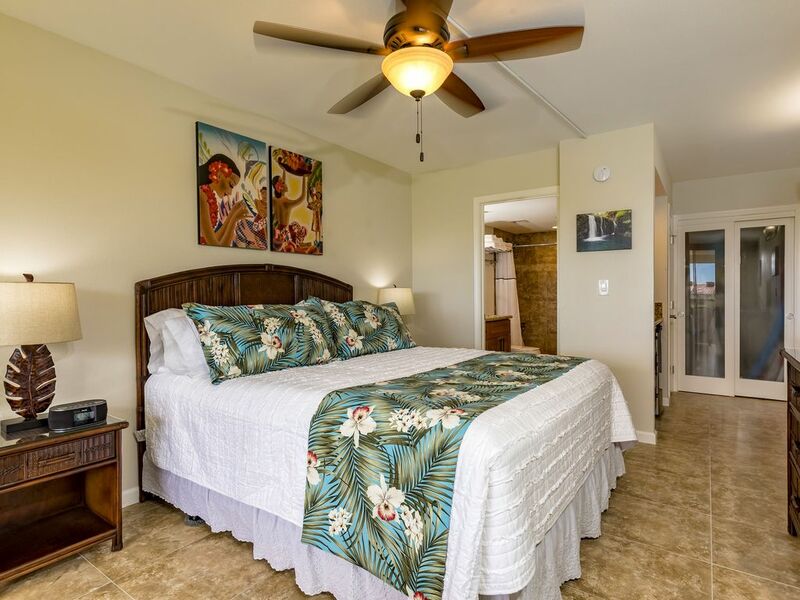 Unit #Q-403A is a fully renovated studio in South Kihei, with a 4th floor partial ocean view. Renovated in July 2017. The studio comes equipped with a comfortable California King bed, full bathroom, and private lanai. The kitchenette (not a full kitchen) includes: Microwave, toaster oven, mini-fridge, & coffee maker. Stay connected with free Wi-Fi and enjoy your favorite shows with the cable tv. Keep cool during the days with the air conditioning and ceiling fan. For outdoor activities, unit #Q-403A is equipped with beach chairs, beach towels, and a cooler. Sleeps 2. Place was great, made the stay enjoyable. Can&#x2019;t wait to do it again!! I came to Maui on a work trip and ended up having a mini vacation. I worked but I was so centrally located I had time to enjoy Maui. The beach was amazing and so easy. I could walk almost anywhere and the unit I stayed in was fantastic!! Most comfortable bed ever!! Thank you so much! Great location, close to shopping, restaurants and beach. Condo is clean and in good condition. It is very small. There is a "kitchenette" but no sink or dishwasher. Coffee cups, plates, etc are washed in the bathroom sink. Clean but very small. kitchenette, but no kitchen sink. close to restaraunts, stores and bars. great location. King size bed, lanai deck with partial ocean view, fridge, microwave, toaster oven, utensils, but no kitchen sink. Washed the dishes in the bathroom. Small table and two chairs. Lots of beach equipment and beach towels. Backpack, but no snorkel gear or life jacket. Close to the beach (easy walk). Location was excellent. Walk to restaurants, shopping and beach equipment rental (inexpensive). Small grocery store nearby, ride bus to larger one (1.5 mi.) Outdoors were two pools and hot tubs. Parking was convenient also. We couldn't figure out the TV so someone from Maui Rentals came right over and helped us. Clean comfortable place with good lighting. Good place! This rental was totally adequate for our stay, we had a most comfortable bed, it was clean and had everything we needed!